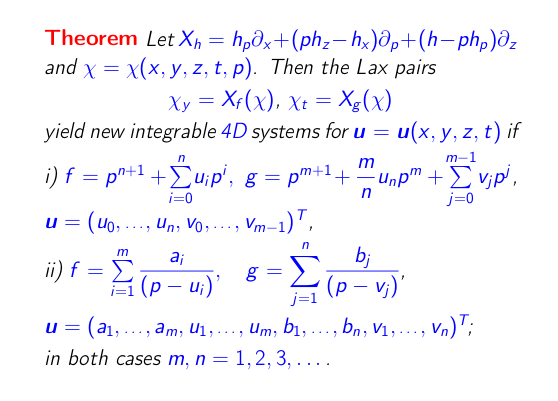 The search for partial differential systems in four independent variables ((3+1)D for short) that are integrable in the sense of soliton theory a.k.a. exactly solvable is a longstanding open problem of mathematical physics as according to general relativity our spacetime is four-dimensional, and thus the (3+1)D case is particularly relevant for applications. Please see the article for the explicit form of two infinite families of integrable (3+1)D systems from the above picture. For example, system (40) from the article in question is a new (and the only known to date) integrable generalization from three to four independent variables for the Khokhlov--Zabolotskaya equation, also known as the dispersionless Kadomtsev--Petviashvili equation or the Lin--Reissner--Tsien equation and having many applications in nonlinear acoustics and fluid dynamics. You may wish to look at these slides for additional background and motivation before proceeding to the articles themselves. This page was last modified on 24 February 2019.